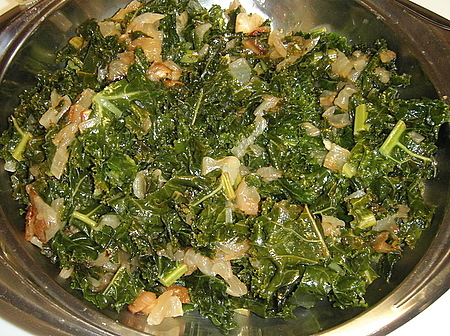 As I don't eat kale I can't say much about this recipe other than our friends Desiree and Grant seemed to like it. Desiree, who's lived in Brazil, thought it needed more oil to be more authentic. In any case, it's very easy to make. I served it as a side dish to a feijoada. Remove the stem from the kale, wash and cut into fine strops. Sauté the onion and garlic in the oil. Add the kale and salt and pepper to taste. Add a little bit of water and cover hte pan. Steam under medium heat until the kale is done.